The Danube Delta is located precisely half way between the Equator and the North Pole. Among its trademark attractions are rare species of birds and animals, such as pelicans, sturgeons or the gone-wild horses of Letea, but also the ways of living of different ethnic communities such as the Russian Lipovans, the Ukrainian Hahols, Romanians, Machedons and so on, communities living among waters, surrounded by reeds and water lilies. The Danube Delta is one of the Europe’s most spectacular location in terms of wetland. Included in UNESCO’s World Heritage sites in 1991, the Danube Delta Biosphere Reserve is The place where the Danube River leaves Europe behind and flows into the Black Sea under constant transformation. Europe’s best preserved delta is far from being frozen in time, or a site that has remained still for millennia. 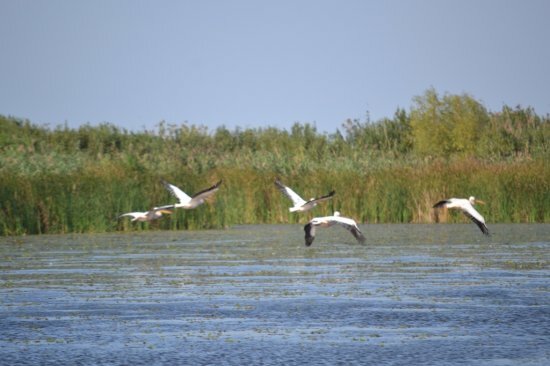 On the contrary, the Danube Delta is perpetually changing, expanding every year with a few dozen square meters due to the 67 million tons of river deposits washed over half a continent. Nevertheless, the ever-changing delta is the natural habitat for ancient fish species, such as sturgeons, a species as old as the dinosaurs managing to survive until present. The 45th North parallel crosses the Danube Delta, marking half the distance between the Equator and the North Pole, turning this site into a spring destination for birds migrating from tropical countries, in search of cooler summers and fish galore, while hosting the Northern species for the winter.